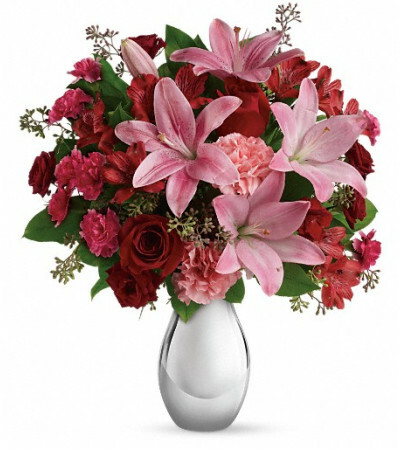 She'll feel the love when she receives this gorgeous array of roses, lilies and more artistically arranged in a dazzling silver reflections vase. 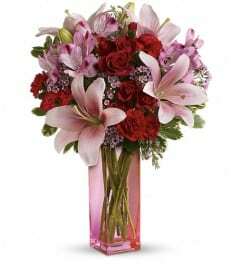 You'll also feel the love when she finishes oohing and aahing and turns to thank you. 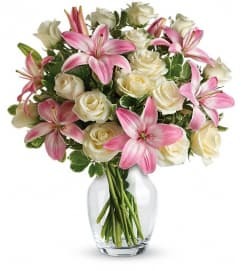 This romantic bouquet includes red roses, red spray roses, pink asiatic lilies, red alstroemeria, pink carnations and pink miniature carnations accented with assorted greenery. Delivered in a silver reflections vase.